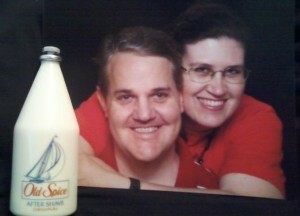 Teresa TL Bruce with her late husband and his last opened bottle of aftershave. Today the Segullah blog published my guest post “Father’s Day Non-Scents” which I wrote during the weeks leading up to this year’s Father’s Day. I hope you’ll visit and enjoy it.